A game that requires the Robotic Operating Buddy to play. Direct R.O.B. to spin gyros and move them on to switches to open red and blue doors so Professor Hector can progress.. In Game A, Professor Hector has to collect all the dynamite in his lab before the timer runs out. Along the way, Hector must also avoid Smicks or distract them with Turnips. In Game B, Professor Hector is sleepwalking through his lab, and you have to make sure he gets to the exit safely. You get points depending on how long Hector stays alive in each stage. A mad scientist whose laboratory has been rigged with Dynamite. He will have to direct the Robotic Operating Buddy (R.O.B.) to open the red and blue gates in his laboratory in order to defuse it. In Game B he is sleepwalking through his lab and R.O.B. has to guide him to safety. 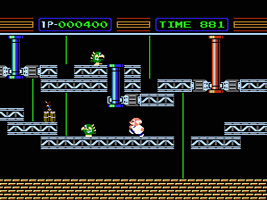 In the 2 Player game, the second player takes turns as Professor Vector. A greedy little Bug that lives in the professor's laboratory. He loves to bite professors, but his favorite food is turnips. If you feed a Smick a turnip then it will leave the professor alone. You can defeat Smick by luring him into a gate and then closing it on him suddenly. There are 6 bundles of dynamite hidden in each stage and sometimes they are invisible. You have to collect all 6 in order to clear the stage. The Smick's favorite food. The professor can pick it up and drop it wherever he wants. If a Smick comes across the Turnip he will leave the professor alone while he eats it.